This Apostle probably comes from the upper part of a rood-screen and is one of twelve panels held in the Museum said to have come from a church in the town or province of Zamora, Spain (inv.nos. A.148 to 159-1922). The Apostles would have stood in a line just below the rood (a large figure of the crucified Christ). Each figure is identified by the inscription on his scroll and by a specific attribute, or symbol. Here St Simon holds his emblem of a small boat. The panel has a plain border on each vertical side, and a base showing three facets in front. The haloed St. Simon, with a spade-shaped beard and wearing a gown and a cloak draped from the left shoulder, holds a small boat in his left hand. In his right hand he holds a painted scroll, reading downwards, with the phrase of the Creed: 'Remissione peccator' (the forgiveness of sins). The right-hand top corner of the panel has been repaired with new alabaster. The upper background is gilt with the remains of gesso knobs. The green foreground is decorated with the usual daisy pattern. Red paint remains in the lining of the saint's cloak. The outline of the halo is green. The capital letter of the inscription is red. The hair and beard of the saint, the borders of his robe and cloak and the sprigs that decorate them are gilt. Details of the eyes are painted. The boat is light brown. The back of the panel bears two lead-plugged holes both with the remains of latten wires. From a church either in the town of Zamora in Spain or in the province of Zamora. One of the 12 panels of the Apostles' Creed Altarpiece. Latterly in the possession of G. Thomas. Gift to the Museum of the National Art Collections Fund in 1922. Bedford, R. P. An English set of the twelve apostles in alabaster. Burlington Magazine. XLII., 1923. p. 130. The Apostles probably come from the upper part of a rood-screen. They would have stood in a line just below the rood (a large figure of the crucified Christ). Each figure is identified by the inscription on his scroll and by a specific attribute, or symbol. 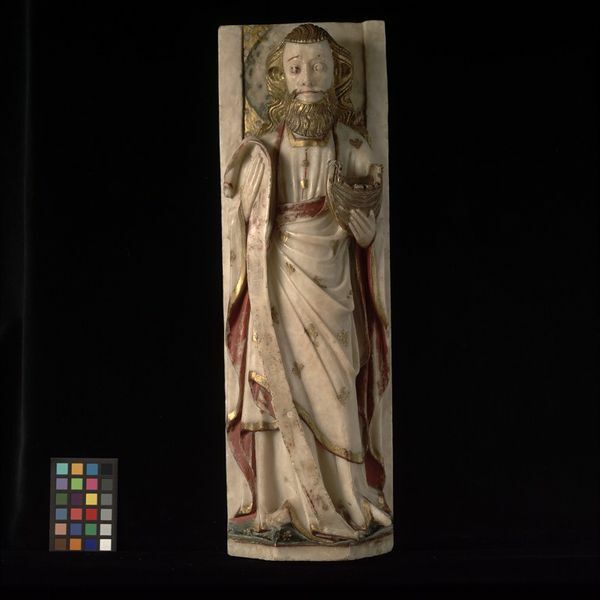 Alabaster, with substantial traces of painting and gilding.